What could be more ideal than a wedding overlooking the breathtaking Niagara River? The Niagara Crossing Hotel & Spa is the perfect venue to host your wedding, anniversary celebration, or any other memorable event. During the spring and summer our second-floor Sunset Terrace, overlooking the Niagara escarpment, makes a beautiful setting for exchanging wedding vows, while the architecture of our hotel is the ultimate picturesque backdrop. View our full wedding photo gallery to envision your special day at Niagara Crossing Hotel & Spa. The Niagara Crossing Hotel and Spa has the unparalleled advantage of being a destination for a wedding, not just a venue. With the combination of luxury accommodations, haute cuisine, and countless activities and adventures at our doorstep, it is the quintessential location to host friends, family, and relatives for a momentous occasion. In our dedication to personal service, we invite you to sit down with our Executive Chef and Special Events Liaison to plan out the menus, events, and details of your wedding as only you can envision. 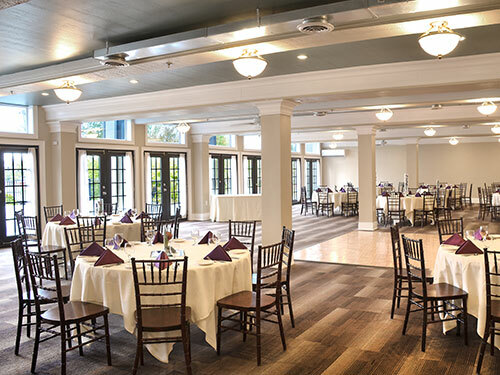 The Niagara Crossing Hotel & Spa features unique reception venues, including the beautifully appointed second floor Lewiston Room which comfortably accommodates 180-200 guests. Connected to the outdoor Sunset Terrace; the views are unrivaled. Envision your special day in scenic Lewiston where you'll be swept away with breathtaking views and unparalleled service. We're with you every step of the way to ensure your wedding is just how you dreamed it would be. For more information contact the Niagara Crossing Hotel & Spa at +1 716-754-9070 or fill out the inquiry form below.